With such opposition, is the Green New Deal dead in the water? Despite what the far left wants you to believe, the Green New Deal isn’t quite as popular as it may seem. It appears the American public isn’t so keen on a plan that purports to eliminate the need for air travel, retrofit every building in the United States, and commit bovine genocide by eliminating flatulent cattle. A recent poll shows that Americans do not favor the proposed legislation being championed by several Democratic presidential candidates and members of Congress. In fact, it only takes a few small pieces of information about the details of the proposal to turn people against it. Remington Research Group conducted a poll that found 51% of American voters oppose the Green New Deal. As you might have guessed, a small majority of Democrats (51%) favor the proposal while Republicans and Independents oppose it. Participants in the study were asked whether they would favor federal funding for a border wall or the Green New Deal. Again, 51% of Americans indicated they would prefer the government to provide funding for a physical barrier at the southern border rather than invest in the Green New Deal. But, border security aside, the study also uncovered another trend: The more educated participants were about the Green New Deal, the less likely they were to support it. 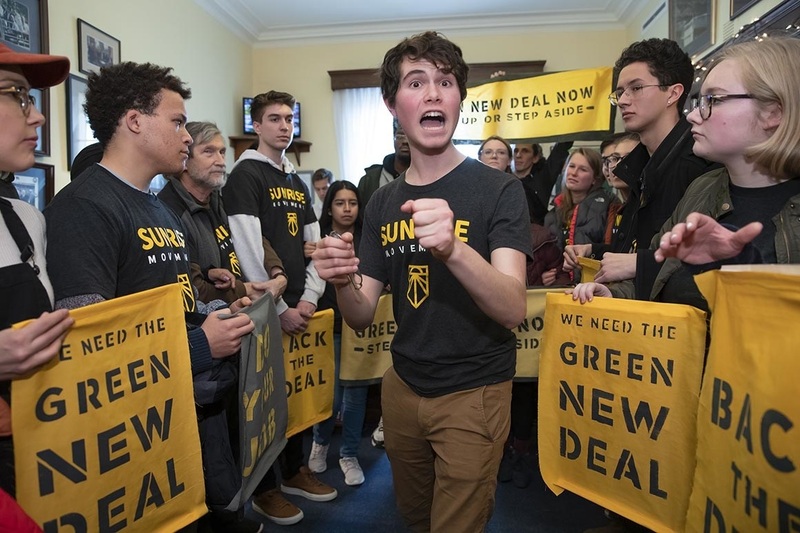 “Q1: The Green New Deal is a set of proposed economic stimulus programs introduced by House Democrats that aim to address climate change and economic inequality. The Green New Deal proposes retrofitting every existing building in the United States to maximize energy efficiency. The estimated $7 trillion proposal also calls for a job guarantee program, as well as universal health care and basic income programs. Knowing this, do you support or oppose The Green New Deal? Many seem to have assumed that the Green New Deal was only about protecting the environment. But the truth is that the legislation also includes issues like state-controlled health care and employment. It’s possible that this could make people wonder what else the Democrats are hiding in the bill. Q2: Researchers have found that the energy efficiency policies outlined in The Green New Deal “are not likely to significantly reduce energy use and greenhouse gas emissions.” Knowing this, do you support or oppose The Green New Deal? One of the most damaging facts about the Green New Deal is that it would not successfully decrease emissions. But this is a piece of information that Democrats leave out when they are pitching these policies – perhaps the results of this part of the survey explain their silence on this issue. Q3: The Green New Deal proposes rebuilding or retrofitting every single building in the United States to follow the new environmental regulations, and is estimated to cost $1.4 trillion for residential buildings alone. Knowing this, do you support or oppose The Green New Deal? While most Americans agree with putting measures in place that will reduce greenhouse emissions, they are not necessarily willing to spend over one trillion dollars to retrofit the nation’s existing buildings. Q4: The Green New Deal promises income equality for all Americans. Those who cannot find work or do not want to work will be included. Knowing this, do you support or oppose The Green New Deal? This is another section of the legislation that does not deal with climate change. Moreover, you won’t find many American taxpayers who favor the idea of subsidizing people who are not willing to work. Q5: The Green New Deal proposes universal healthcare managed by the federal government, meaning all Americans would be required to use government-managed healthcare. Knowing this, do you support or oppose The Green New Deal? There are plenty of people who favor state-run health care. But the majority of Americans still oppose this type of intrusion, and most would not be happy about being required to use government-provided health services. The results speak for themselves. When given even a modicum of information on the proposal, everyday Americans can see that the Green New Deal is not all it’s cracked up to be. The far-left wing of the Democratic Party has its work cut out when it comes to moving its agenda forward. It is important to note that those Democrats who support the Green New Deal make up only a slim majority — the rest of the party opposes it. Moreover, the study shows that once people are educated on the details of the bill, they are no longer so willing to support it. So the question is: Why are progressive lawmakers attempting to push such an unpopular piece of legislation? The Democratic frontrunners vying for the 2020 presidential nomination have already thrown in with the socialist crowd and been seen touting these policies on the campaign trail. The fact that a majority of American voters do not favor their radical ideas bodes poorly for their chances of winning the next election. No one supports the Green New Deal. No one ever took it seriously, not for a moment, not even AOC and she’s so crazy, she can take the bark off a tree. It is simply a talking point to determine ideological purity and a pragmatic, political bargaining position. The Green New Deal is nothing more than a starting point in negotiations for another huge, federal boondoggle of tax payer funds to be distributed among Democratic, political contributors. Can you say Solindyra? It’s past time to simply kick these idiot children and the professional, Democrat manipulators behind them square in the azz and out the door. Is Anybody in Control of Anything in the New Congress?